Go–karts are super fun, whether you’re an adult or a kid. Speeding around a track, racing your friends – it’s a thrill! Unfortunately, there aren’t as many go–karting options in the city now as there once were. That being said, we’ve put together a shortlist of places in and around Pune, where you can enjoy go–karting with your squad. IndiKarting is currently Pune’s only remaining go–kart track, located near Eon IT Park in Kharadi. Started by champion racer Rayomand Banajee, IndiKart often plays host to professional bike and go–karting races. If you just want to have a bit of fun with friends, it’ll cost you INR 299 for 3 laps, and INR 400 for 5 laps on their 265m track. Only children above the age of 8.5yrs will be allowed to drive a go–kart. IndiKarting also conducts their own ‘Basics in Karting‘ course (with Rayo Racing), which is for those who want to take go–karting a bit more seriously. Through this workshop, you can learn what it’s like to turn go–karting into a professional career, as well as the fundamentals and basic knowledge you’ll be able to put to use for racing. Their timings are from 2.30 pm – 9.30 pm (Monday to Friday), and 11.00 am – 9.30 pm (Saturday and Sunday, with a lunch break from 1-2 pm). Follow them on Facebook for all the latest updates and check out their event page here, for their racing and workshop schedules. Govinda Resorts describes themselves as ‘a serene retreat’ tucked away in Lonavala, just off the Mumbai-Pune highway. They also boast the *only* functioning go–kart track in Lonavala – which they recently renovated. Anyone aged 12yrs and older can drive the go–karts here. It’ll cost you INR 300 for a single-seater, and INR 400 for a double-seater, for a total of four rounds. The resort also features a handful of other activities, like swimming, a cycling track, outdoor sports (football, cricket, volleyball), a ‘rain dance’, jacuzzi, children’s play area, and indoor games (table tennis, chess) – but these are only accessible to guests of the resort. The go–kart track is open to guests as well as outsiders, from 9.00 am to 7.00 pm – daily. You may also grab a bite to eat at their pure veg restaurant to re-fuel yourself after you’re done. We recommend calling ahead before you make the drive from Pune to Lonavala. 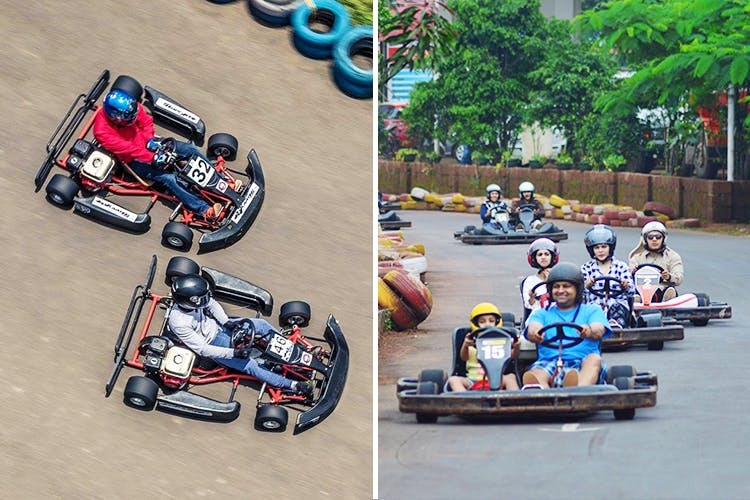 Velocity Entertainmentz touts themselves as a one-stop ‘get-away to go–karting, amusement, and food’, with ‘India’s only professional go–kart track on a mountain’. Located on the main road between Mahabaleshwar and Panchgani, this amusement park has been built right in the lap of nature; surrounded by the beautiful Sahyadris, with enticing cool weather all-year-round. Test your go–karting skills on their 450m track (the longest karting circuit in the area), with ‘5 corners and one speed-curve’ that’s built for thrills. It’ll cost you INR 350 for a single-seater and INR 650 for a double-seater go–kart – for 4 laps total. The age limit is 6yrs of age and above, so it’s fun for (almost) everyone! Velocity Entertainmentz is open from 9.00AM to 9.00 pm every day, and their 10-acre property boasts other outdoor activities like ATV off-roading a 150m zip-line (with gorgeous views over the Krishna river valley), a drop-tower, giant wheel, bungee ejection, rodeo bull, gyroscope, and more, as well as indoor games for those who prefer them. Enjoy a meal at Temptations – their pure veg restaurant, or their ice cream counter, and snacks counter. Other resources here include an ATM, Petrol Pump, a couple of small shops (one for fruit products, one for toys), and of course – washrooms. We suggest getting here early on, and making a full day of it with your friends and/or family. Stay tuned to their Facebook page for all the latest events and happenings at the property. Remember to take appropriate precautions in the heat – carry a hat, sunblock, and sunglasses. Make sure to wear closed shoes, the prescribed safety gear, and not to take unnecessary risks! Overall – remember to have fun.